On February 15, 1996 the newly-relocated Cleveland Browns, now in Baltimore and without a name (not to mention a franchise history that was left in the former city), hired Ted Marchibroda as head coach. 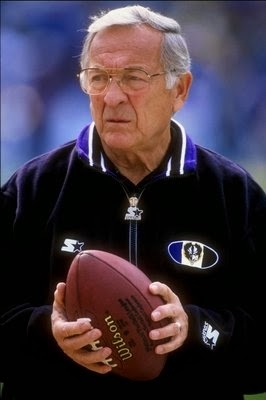 Marchibroda, a familiar figure in Baltimore where he had once coached the Colts, signed a three-year contract. In their last season in Cleveland, the Browns went 5-11 under Bill Belichick, who was fired along with Mike Lombardi, the personnel director. It had been a tumultuous year, with Belichick briefly benching veteran QB Vinny Testaverde in favor of backup Eric Zeier and WR Andre Rison, a costly free agent acquisition, producing little and complaining loudly. Following the announcement that the club would be moving, the Browns went 1-6 to close out the season. It was hoped that Marchibroda, who was a month short of his 65th birthday, would not only be an identifiable face on the sideline for Baltimore fans, but someone who could turn the team’s fortunes around quickly. He had done just that in 1975, when he took over a Colts team coming off a dismal 2-12 record and led them to a 10-4 division-topping tally. It was the first of three straight years atop the AFC East, although they lost in the Divisional round of the playoffs each time. With injuries knocking QB Bert Jones out of the picture, the team dropped to 5-11 in both 1978 and ’79, and Marchibroda was gone. His record over the five years was 41-33 in the regular season, 0-3 in the playoffs. Marchibroda had come out of the University of Detroit to play quarterback for the Steelers and Cardinals over the course of four seasons. He first became an assistant coach in the NFL under Head Coach George Allen with the Rams and was Allen’s offensive coordinator in Washington immediately prior to his first head coaching stint with the Colts. Afterward, he served as offensive coordinator with four teams before again becoming head coach of the Colts, now in Indianapolis. Marchibroda’s record was 30-34 in his second stint, but Indianapolis had gone 9-7 in 1995 and reached the AFC Championship game. He was fired after refusing to accept a one-year contract extension and offensive coordinator Lindy Infante was promoted to head coach in his place. It may have felt like a homecoming for the new coach, but it was a chaotic time for the franchise. Owner Art Modell, as part of a settlement brokered by the NFL, was required to change the team colors as well as leave behind the franchise history, which led to oddities like the players wearing generic black-and-white uniforms during a minicamp. The team was eventually renamed the Ravens with colors of black, purple, and gold. As both a head coach and an assistant, the ex-QB Marchibroda had been known for his success in working with quarterbacks, including Bert Jones, Jim Kelly of the Bills, and Jim Harbaugh in Indianapolis. 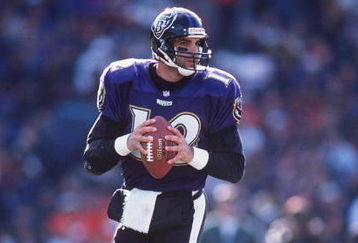 The success continued with Vinny Testaverde (pictured below), whose career had been decidedly uneven since being the first overall draft choice by the Buccaneers in 1987. He had a fine season in ’96, achieving career highs with 4177 passing yards and 33 touchdowns and receiving Pro Bowl recognition for the first time. But for all of the fine offensive display, the team finished at 4-12. The Ravens put 371 points on the board, but the defense gave up 368.1 yards per game and a total of 441 points. That unit ranked last in the NFL and was especially bad at protecting leads in the fourth quarter. While one of the team’s first draft choices, Ray Lewis, was an immediate hit at middle linebacker, and FS Eric Turner was selected to the Pro Bowl, there were too many holes in the defense at large, which was hit hard by injuries. The Ravens were further hindered by a poor salary cap situation in the offseason that made addressing issues problematic. The defense improved in 1997, with rookie linebackers Peter Boulware and Jamie Sharper joining Lewis to create a solid group. DE Michael McCrary and DT Tony Siragusa, obtained from the Seahawks and Colts, respectively, performed well on the line. The unit as a whole, coached by coordinator Marvin Lewis, was showing signs of coming together. However, the offense regressed. While tackles Jonathan Ogden and Orlando Brown were stalwarts on the line, Testaverde had a lesser year and was lost for three games with a knee injury. Bam Morris continued to have off-field problems and rushed for 774 yards in 11 games. The overall record of 6-9-1 was better, but still a losing one. For 1998, the pressure was growing to show improvement, especially with the team moving into the new PSINet Stadium. Testaverde was waived, moving on to the Jets, and Jim Harbaugh, a 12th-year veteran who had prospered under Marchibroda in Indianapolis, was obtained to take his place. RB Errict Rhett came from the Buccaneers to improve the ground game, but neither acquisition worked out well. Rhett’s failure was mitigated by the fine performance of RB Priest Holmes, a second-year player who had made the club as an undrafted free agent and played on special teams as a rookie. Taking over for Rhett, he rushed for 1008 yards and also led the Ravens with 43 pass receptions. Rookie CB Duane Starks stepped successfully into the starting lineup as the defense continued to jell. The team had trouble putting points on the board, especially during a four-game losing streak that followed a 2-2 start, on the way to a 6-10 final record. It was the end of the line for Marchibroda, whose three-year tally was 16-31-1. It also proved to be the end for his coaching career and he became a radio commentator for Colts broadcasts for the next several years. The Ravens hired another offense-minded head coach, Brian Billick, who kept Marvin Lewis on as defensive coordinator. In 2000, it was the defense, which Lewis was building up during the Marchibroda era, that led the way to a NFL Championship.